The Mystery of Pentecost, the Out-Pouring of the Holy Ghost on the Apostles and all of Creation, is the beginning of the fruits of Christ's actions among us. The Holy Ghost makes all of us divine if we will but let Him into our lives and reform, reshape, heal, cleanse, make whole what is shattered, make up what is lost, and in our weakness to fill us with strength. This is my own parish's feast day and why I answer anyone asking "What should we pray for?" with "Revival". This is what my parish should be doing: holding the heavenly doors open for the continued outpouring of the Holy Ghost on us, on San Francisco, and on the world around us. But it is also what all of us should be doing as Christians. As we are the Body of Christ and as Christ prays for the Father to send the Spirit so should we be likewise doing. Not for some sort of Benny Hinnesque back-falling of moaning with our mouths flecked with foam. But for salvation. Peace. Joy. Holiness. Love. Against these the only thing standing is our refusal to pray. The embolism I use is "sending us the Holy Ghost from his father." The texts I've woven in below come from the Vespers and Matins for Pentecost. 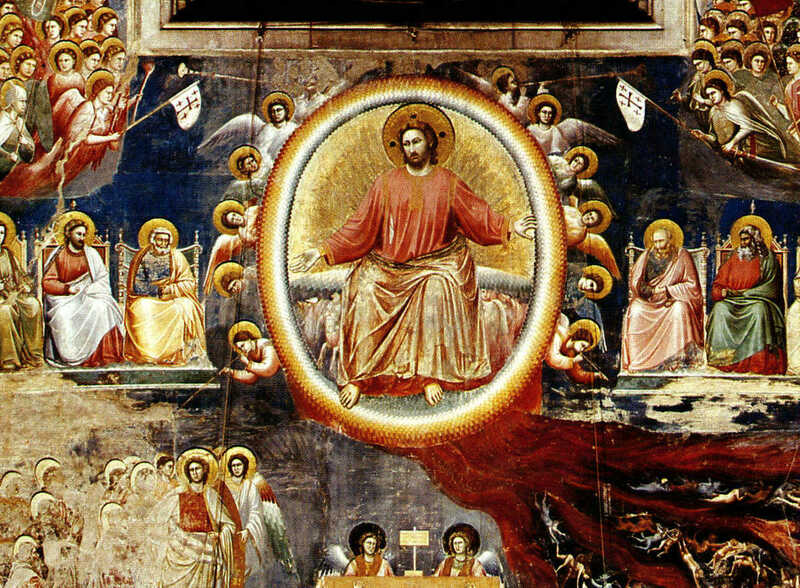 Our Lord's Ascension is the first evidence that the "key has changed" as I noted in the last mystery: the Eastern liturgical texts speak of how amazed the Angels are at seeing one of our race of men entering into the Heavens. The Psalm text, "Who is this king of glory?" 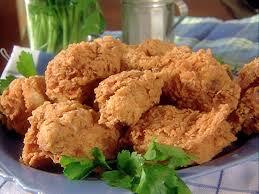 is read as the angels asking each other "Look! Who is this? Who comes here? Who?" It's a mortal man now immortal and a divine being now dead and alive again. The King of All the Ages, by gift of his Father, is one of us. And there is no "one of us" there is only "All of Us". As in Adam, all die: even so in Christ shall all be made alive. The embolism I use is "the incarnate Word of God ascending to His Father's throne." Tomorrow, 25 October, is the Sunday of Christ the King in the Pre-Vatican II Ordo - the "Extraordinary Form" - for the Roman Church and also in the Antiochian Western Rite Vicariate, which last also uses the older calendar as well. On the Novos Ordo calendar this feast is the last Sunday before Advent starts, this year that is 22 November. The ROCOR Western Rite folks use the Novos Ordo calendar to calculate this feast, for some reason. ROCOR, of course, calculates the Nativity feast on the Julian Calendar, so their Advent starts much later: their Calendar commemorates Christ the King Sunday on the 6th of December (NS) which is 23 November on the Julian Calendar. If we (Orthodox, Old Calendar and New, together with the Roman Catholics on both the EF and Novus Ordo) count everything, we might see the time, this year, from 25 October - 6 December (23 November OS) as "Kingdomtide." There is no "Christ the King" on the ER calendar and All Saints Sunday is linked with the paschal cycle, usually falling in May or June. But I pray the Eastern Rite folks (Orthodox and ByzCath) will join in this project! If you are inclined to yell "Ecumenism!" please lay aside, for a moment, all superfluity of snarkiness: I want us to take over the internets with saints. Christ the King Sunday - proclaiming the Kingship of Christ not only in the next world and "in our lives" but also in this world, now, here - is tied to All Saints Day and All Souls Days in the calendars in order to link, liturgically, the idea of Christ reigning as King of all his people in Heaven, on Earth, and in the Afterlife. Let us to take over the internet with saints and proclaim the kingship of Christ! First off: All Saints Day is not stolen from the pagans. Read this. Let's reclaim our holiday and our season. Replace all your social media avatars/user icons with an image of your patron saint; failing that, of Christ the King. Don't opt for the "spookification" process. Last year I was "Boo! Richardson". Rather, if possible, put your patron saint there. "William Francis", "Huw Raphael", or "Susan Elizabeth", etc. Please do this from tomorrow to, at least, 2 Nov... but I would think we could do all of Kingdom Tide this way, from now until at least the start of Advent (on whatever calendar you use, ER/WR OC/NC). Forgive me for the late start. I know we mightn't get much done. But we're laying the ground work for next year! As the Funeral Mass says, "For thy faithful people, O Lord, life is not ended, but changed." This Mystery changes the key signature of the entire work. What went before - both joy and sorrow - now has meaning. What comes after now is possible - for it wasn't at all possible before. I ascend to my Father and your Father. He wasn't our Father before: save in the law. Now, if we are in Christ, in the Resurrection, we are a New Creature. The Old Man is passing away: God is our Father. Now we are the very Sons of God in Christ, "buried with him in baptism and raised to walk in newness of life". My own words fail me here. So I will resort, in this mystery, to the Paschal Homily of St John Chrysostom. If these seem wordy, remember: the little extra verses are for reading while you pray. For "on the go" praying (I love the Rosary for walking), just use an embolism. Hail, Mary, full of grace, the Lord is with thee; Blessed art thou amongst women, and blessed is the fruit of thy womb, Jesus, risen from the dead, trampling down death by death. Holy Mary, Mother of God, pray for us sinners, now and at the hour of our death. Amen. Recently I found another collection of embolisms for the Rosary on this page. 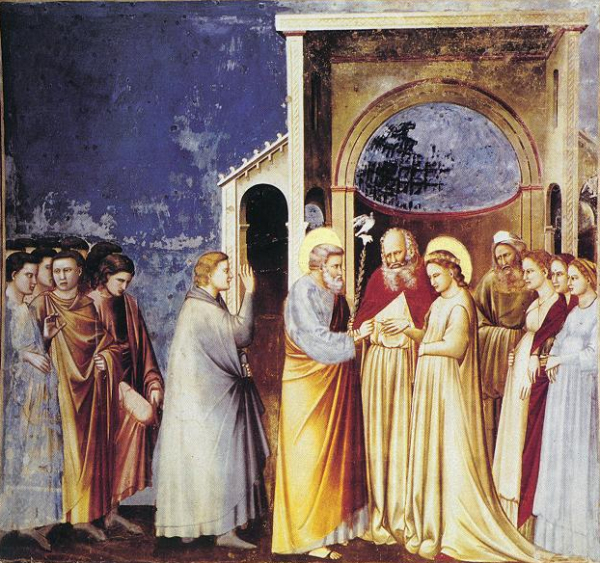 The Fifth Sorrowful Mystery is perhaps one of the most visual images of our faith. Everyone seems to know what a cross is, and most people have seen an artistic rendering of Crucifixion. 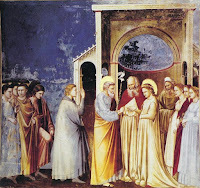 The image below is form Giotto's Life of Christ, as are many of the works used to illustrate this series. When we see the Crucifixion, I don't know if we see it for what it really is: not only capital punishment, but ignominy. Those condemned to death in the arena might die fighting. Those beheaded, like John Baptist, died quickly. Those left to rot in prison died slowly in the dark. Those crucified, however, were exposed to public and official ridicule, dying slowly through asphyxiation whilst fighting for every breath. We have no equivalent in the modern world: our executions take place quietly and behind closed doors. This is Jesus sanctifying death. The death of Christ on the Cross is the supreme triumph of life. "O life, how canst thou die?" We seeing on Friday night. Life cannot die. Breathing can be stopped, the heart can be stopped, but Zoe is for ever. All of life now - from conception, to birth, to the tomb - is an open door. Death is no longer "the end" but the gateway to the fullness of life in God. There is no fear. There can be precious little sorrow. Jesus, by his Incarnation, Death, and Resurrection (for this Mystery is not the Last) has open for us the entrance to Eternal Life: we have only to walk through. "...blessed is the fruit of thy womb, Jesus; the Incarnate Word of God, crucified, dead, and buried. Holy Mary, Mother of God, &c...."
The verses below are taken from the Good Friday Matins and Vespers. Christ carries the Cross. It is at this point that his path has grown into full parallel with ours for we are each called "to take up your cross and follow" Christ. What is your cross? You want to, I'm sure, look for some great thing to be your cross. Forgive me if I am projecting. But if the Cross is a sign of our death, our loss of the illusion of self-ownership in sacrifice to Christ, then the Cross is our very life. The things that mlake you you; that make me me. Our passions, our talents, our temptations, our joys, our friends and loves, our families, our loss, our pain, our mourning. If we are here to "work out your salvation in fear and trembling" then it is your very gifts, your wins, and your losses, that are your cross. To be clear, this is not a subtle, Disneyesque plea to "be yourself and everything will be fine" except insofar as "be yourself" is not "the me I think I know" but rather, "the me God wants me to be": this is not defined by "follow your bliss" or by giving in to your desires, lusts, cravings, and passions. You must become, by his grace, the you that God set out to create: the loving, self-sacrificing, God-praising, and God-pleasing light in your corner of the world. We must avoid any claim of "if it's hard I must be doing it wrong." In fact, it is when things are to easy that you're doing it wrong! Christ carries the Cross. This is not "for us" in the sense of paying a debt, but rather to show us how it's done. You, too, in conforming to Christ, will die. And rise. The embolism I use in this Mystery is "the Incarnate Word of God, carrying his cross." The verses below are taken from Matins for Holy Friday. Although we moderns cannot enter the pious hearts of our ancestors, I think we might see something here, if we open our own hearts to Christ, who is the King of All in All Ages: he is crowned not by his own people, but rather by the Army of the then-King-of-the-World. Although the pattern had not yet started, it was the same way that future Emperors of Rome would be crowned by their legions and then brought to Rome. But here it is a mocking. Yet in Christ is fulfilled the real meaning of the Divine Kingship that all monarchs share: not only to rule, but to be a bridge and a sacrifice. 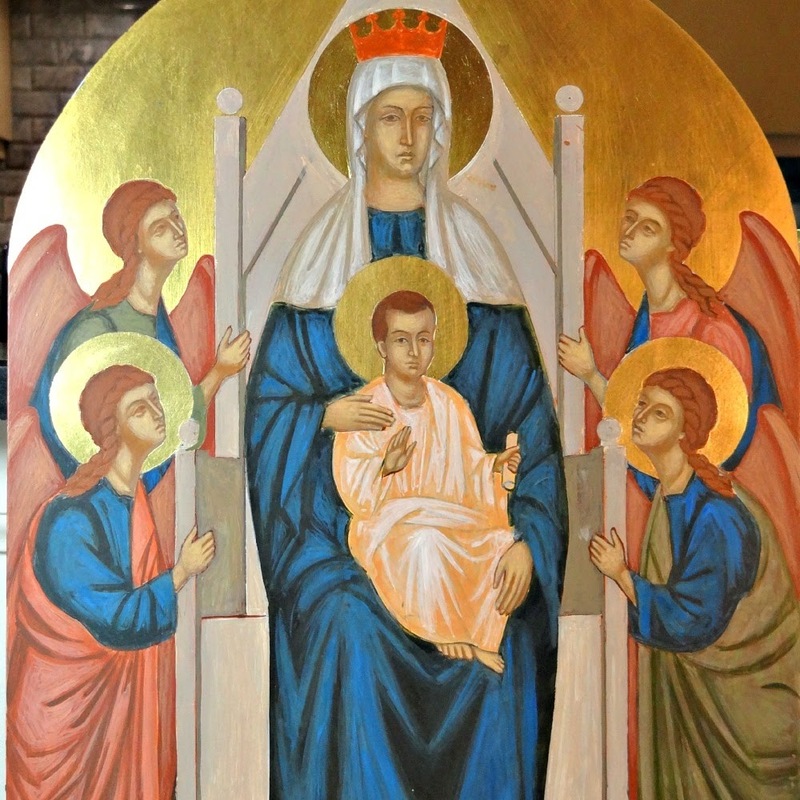 It is Gentiles at the beginning of his life who hail Christ as king. It is Gentiles at the end of his life who mock him as king again. The mocking is merciless bullying, but it seems odd to put it here. Why did the soldiers do this? Recently it dawned on me that Jesus was near collapse after the scourging. Ever see someone get drunk at a college party, pass out on the sofa, and then his fraternity buddies will draw pictures on his face? That's what I see here. Dress him like a king! Crown him with thorns! Laugh and spit! Hey, this is getting boring, slap him and wake him up... yo, prophet dude, who hit you? Bwahahahaha. Do we Gentiles today claim him as king as the wise men did, in sincerity with gifts and honour; or as the Romans did, in mockery, with pain and blood? When you cast your crowns before your King, does it wound him? There is one other Crown in the Rosary (two actually) and we won't get to that for a few weeks, but I think it is interesting, that these two crowns are here. In praying this mystery, I add the embolism "the Word of God incarnate, crowned with thorns by the Romans" after the Holy Name. In the meditation below, rather than Byzantine hymnody, I have chosen to use verses from the western hymn, O Sacred Head Sore Wounded. There are rather a few more verses than you may be familiar with! At the end of the posting there is a video to let you hear the melody. The Scourging of our Lord Jesus Christ by the Romans - at the command of Pilate - is a favourite visual image: it has more action than the Crucifixion and also more blood. Movie makers love it: it's gory and allows them to play others off Jesus as bad guys. See how cruel the Romans are to this peaceful teacher? Since the Occupied Nation could not do such things to her own citizens, it was the Romans who did it. The scriptures say Pilate wanted to let Jesus go but had him scourged just to make a point. Roman cruelty towards its occupied peoples. Ever see Spartacus? Ben Hur? Romans are often the Bad Guys. In mediæval piety there was a great fascination with the scourging: how many times was Jesus struck with how many whips? How many tails on each whip? How many leaded hooks on each tail? The count of the wounds let to a different level: how many drops of blood from each wound? Without flippancy, my first comment is: they had no television. Church provides all the brightest and most colorful visuals in an otherwise dull life pattern. This is not a visual, however: this is a counting and calculation. This is mental play for when there is no pageantry. Hail, Mary, full of grace, the Lord is with thee; Blessed art thou amongst women, and blessed is the fruit of thy womb, Jesus, scourged at the pillar. Holy Mary, Mother of God, pray for us sinners, now and at the hour of our death. Amen. The Byzantine Rite text I modified for this meditation comes from the "Akathist to the Divine Passion of Jesus Christ", available in full at Monochos. It's quite a vivid text. Since approved liturgical sources rarely provide authors and dates, we're left with guessing: my guess would be Russian and mid to late Victorian era. When I ask God for an Orthodox Western Rite parish to be founded in San Francisco, I do so under the intercession of the Four Latin Doctors of the Church, the Great Teachers of the West: Sts Gregory the Great, Ambrose, Augustine of Hippo, and Jerome. Today is the feast of the latter-most and I post here his Vita, as recorded in the Breviary Office for this day. Antiphon: O Doctor right excellent, O light of Holy Church, O blessed Jerome, lover of the divine law, entreat for us the Son of God. V. The Lord loved him, and adorned him. R. He clothed him with a robe of glory. 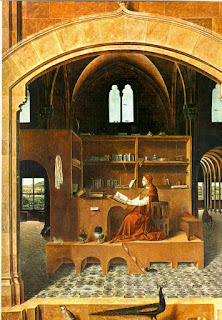 O God, who for the exposition of thy holy Scriptures didst bestow upon thy Church the wondrous teachings of blessed Jerome thy Confessor and Doctor : grant, we beseech thee ; that by the intercession of his merits, we may of thee be enabled to perform those things which he taught in word and deed. Through Jesus Christ, thy Son our Lord, who livest and reignest with thee, in the unity of the Holy Ghost, ever one God, world without end. Amen. The Passion in the Garden is Jesus' last "alone time" before the climax of his ministry. He often went aside to pray, but, as it were, those might be considered "training prayers" for this one. He experienced stress, certainly (as seen by the bloody sweat) and probably fear. He asked his Father if there was another way - even after he had committed to doing this. See the verses below from Byzantine Holy Week: as God he was among the plotters agreeing to his own betrayal. For the Orthodox, it is Jesus' action in his own passion that is important: for us mortals, a "passion" implies (as Kallistos Ware points out) the Latin passio, something that happens to us. For Jesus, it's something he undertakes willfully. He allows Judas to sell him to the Jews. He allows the Jews to give him to the Romans. He allows the Romans to nail him to the Cross. He allows the demons to take him into hell. And then... O, Glorious God of All, what then! Oh, and what more in your love for us! Glory to Thee!